This article is about the Dutch province. For other uses, see Friesland (disambiguation) and Frisia (disambiguation). 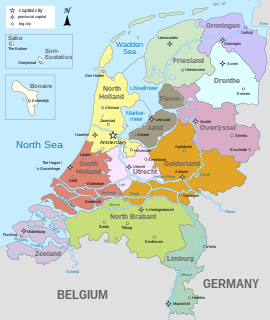 Friesland (Dutch pronunciation: [ˈfrislɑnt] ( listen ); official, West Frisian : Fryslân [ˈfrislɔːn] ( listen )), also historically known as Frisia, is a province of the Netherlands located in the northern part of the country. It is situated west of Groningen, northwest of Drenthe and Overijssel, north of Flevoland, northeast of North Holland, and south of the Wadden Sea. In 2015, the province had a population of 646,092 and a total area of 5,100 km2 (2,000 sq mi). The capital and seat of the provincial government is the city of Leeuwarden (West Frisian: Ljouwert), a city with 91,817 inhabitants. Since 2017, Arno Brok is the King's Commissioner in the province. A coalition of the Labour Party, the Christian Democratic Appeal, and the Frisian National Party forms the executive branch. The province is divided into 18 municipalities. 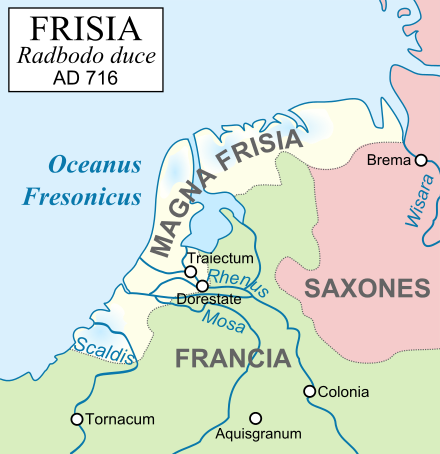 The area of the province was once part of the ancient, larger region of Frisia. The official languages of Friesland are West Frisian and Dutch. Arnoud Adrianus Maria "Arno" Brok is a Dutch politician serving as the King's Commissioner of Friesland since 2017. A member of the People's Party for Freedom and Democracy (VVD), he previously served as Mayor of Sneek from 2003 to 2010 and Mayor of Dordrecht from 2010 until 2017. The Fryske Akademy, founded in 1938, is the scientific centre for research and education concerning Friesland and its people, language and culture, this in its broadest sense. The institution is based in the Coulonhûs and adjacent buildings in Leeuwarden. Together with several other institutes it belongs to the Royal Netherlands Academy of Arts and Sciences (KNAW). It has about 60 employees. In addition, some 300 scientists, amateurs and professionals, are active in the scientific societies hosted by the Fryske Akademy. In the 1st century BC, the Frisii halted a Roman advance and thus managed to maintain their independence. Some or all of the Frisii may have joined into the Frankish and Saxon peoples in late Roman times, but they would retain a separate identity in Roman eyes until at least 296, when they were forcibly resettled as laeti  (Roman-era serfs) and thereafter disappear from recorded history. Their tentative existence in the 4th century is confirmed by archaeological discovery of a type of earthenware unique to 4th-century Frisia, called terp Tritzum, showing that an unknown number of Frisii were resettled in Flanders and Kent,  likely as laeti under the aforementioned Roman coercion. The lands of the Frisii were largely abandoned by c. 400 as a result of the conflicts of the Migration Period, climate deterioration, and the flooding caused by a rise in the sea level. Charles V, the Holy Roman Emperor, became the first lord of the Lordship of Frisia. He appointed Georg Schenck van Toutenburg, who had crushed the peasants' revolt, as Stadtholder to rule over the province in his stead. When Charles abdicated in 1556, Frisia was inherited by Philip II of Spain along with the rest of the Netherlands. In 1566, Frisia joined the Dutch Revolt against Spanish rule. In 1577, George de Lalaing, Count of Rennenberg was appointed Stadtholder of Frisia and other provinces. A moderate, trusted by both sides, he tried to reconcile the rebels with the Crown. But in 1580, Rennenburg declared for Spain. The States of Frisia raised troops and took his strongholds of Leeuwarden, Harlingen and Stavoren. Rennenburg was deposed and Frisia became the fifth Lordship to join the rebels' Union of Utrecht. From 1580 onward, all stadtholders were members of the House of Orange-Nassau. With the Peace of Münster in 1648, Frisia became a full member of the independent Dutch Republic. Friesland is situated at 53°8′N5°49′E﻿ / ﻿53.133°N 5.817°E﻿ / 53.133; 5.817 in the northwest of the Netherlands, west of the province of Groningen, northwest of Drenthe and Overijssel, north of Flevoland, northeast of the IJsselmeer and North Holland, and south of the North Sea. It is the largest province of the Netherlands if one includes areas of water; in terms of land area only, it is the third-largest province. There are four national parks of the Netherlands located in Friesland: Schiermonnikoog, De Alde Feanen, Lauwersmeer (partially in Groningen), and Drents-Friese Wold (also partially situated in Drenthe). The province is divided into 18 municipalities, each with local government (municipal council, mayor and aldermen). 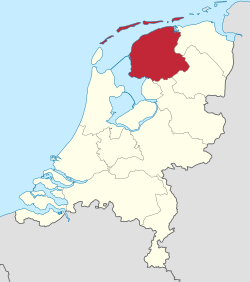 Friesland is the only one of the twelve provinces of the Netherlands to have its own language that is recognized as such, West Frisian. The province is famous for its speed skaters, with mass participation in cross-country ice skating when weather conditions permit. When winters are cold enough to allow the freshwater canals to freeze hard, the province holds its traditional Elfstedentocht (Eleven cities tour), a 200-kilometre (120 mi) ice skating tour. A traditional sport is Frisian handball. Another Frisian practice is fierljeppen , a sport with some similarities to pole vaulting. A jump consists of an intense sprint to the pole (polsstok), jumping and grabbing it, then climbing to the top while trying to control the pole's forward and lateral movements over a body of water and finishing with a graceful landing on a sand bed opposite to the starting point. Because of all the diverse skills required in fierljeppen, fierljeppers are considered to be very complete athletes with superbly developed strength and coordination. In the warmer months, many Frisians practice wadlopen , the traditional art of wading across designated sections of the Wadden Sea at low tide. The King's Commissioner of Friesland is Arno Brok. The States of Friesland have 43 seats. The Provincial Executive is a coalition of the Christian Democratic Appeal, the People's Party for Freedom and Democracy, the Socialist Party and the Frisian National Party (FNP). Ameland Airport near Ballum  and Drachten Airfield near Drachten  are the two general aviation airports in the province. The Royal Netherlands Air Force uses Vlieland Heliport and the Leeuwarden Air Base. Ameland is a municipality and one of the West Frisian Islands off the north coast of the Netherlands. It consists mostly of sand dunes. It is the third major island of the West Frisians. It neighbours islands Terschelling to the west and Schiermonnikoog to the east. This includes the small Engelsmanplaat and Rif islands to the east. Stadsfries or Town Frisian is a set of dialects spoken in certain cities in the province of Friesland in the northern Netherlands, namely Leeuwarden, Sneek, Bolsward, Franeker, Dokkum, Harlingen, Stavoren, and to some extent in Heerenveen. For linguistic reasons, the outlying and insular dialects of Midsland (Terschelling), Ameland, Het Bildt, and Kollum are also sometimes tied to Stadsfries. The West Frisians – or, more precisely, the Westlauwers Frisians – are those Frisian peoples in that part of Frisia administered by the Netherlands: the Province of Friesland, which is bounded in the west by the IJsselmeer and in the east by the River Lauwers. Johannes Jan "Joop" Atsma is a Dutch politician of the Christian Democratic Appeal (CDA) party and sport administrator. He has been a Member of the Senate since 9 June 2015. Omrop Fryslân is a special broadcaster on the NPO which serves the Frisian community. Because West Frisian is an official language of the Kingdom of the Netherlands, the NPO is also responsible for broadcasts in the West Frisian language. Psy-Fi is an annual open air psychedelic music and arts festival in the Netherlands. The first edition was held in July 2013 in the Stadspark of the city of Groningen; all subsequent editions have been held in recreation area De Groene Ster to the east of Leeuwarden. It is one of the largest international festivals in the Netherlands and attracts thousands of visitors each year, with the 2017 edition reporting participants from about 100 different countries. In 2019, project leader Wiebe Kootstra stated that only 18% of the attendees lived in the Netherlands, the rest visited the festival from abroad. ↑ "Beslut fan Provinsjale Staeten van Friesland" [Resolution of the Provincial Council of Friesland]. Provinciaal Blad van Friesland (in Western Frisian) (7). 28 March 1996. ↑ "Ook voor rijk heet Friesland Fryslân" [Friesland to be called Fryslân across the realm]. Leeuwarder Courant (in Dutch). 10 November 2004. Retrieved 11 August 2012. ↑ Brand, Hanno (2011). Cole, Jeffrey E., ed. Frisians. Ethnic Groups of Europe: An Encyclopedia. Santa Barbara, California. p. 150. ISBN 978-1-59884-302-6. ↑ Pliny the Elder & 79_3 :340–341, Natural History, Bk XVI Ch 2: Wonders connected with trees in the northern regions. ↑ Tacitus 117 :253, The Annals, Bk XIII, Ch 54. Events of AD 54–58. This was confirmed by Tacitus when he said that in an incident where the Frisii had taken over land, they then settled into houses, sowed the fields, and cultivated the soil. ↑ Tacitus 117 :147–148, The Annals, Bk IV, Ch 72–74. Events of AD 15–16. Tacitus specifically refers to the herds of the Frisii. ↑ Tacitus & 98 :18–19, 23–24, 36–37, The Germany, Ch V, VII, XVI. ↑ Tacitus 117 :253, The Annals, Bk XIII, Ch 54. Events of AD 54–58. ↑ Minahan, James (2000). One Europe, many nations : a historical dictionary of European national groups. Westport, Conn: Greenwood Press. p. 264. ISBN 9780313309847. ↑ Looijenga, Jantina Helena (1997), "History, Archaeology and Runes", in SSG Uitgeverij, Runes Around the North Sea and on the Continent AD 150–700; Texts and Contexts (PhD dissertation) (PDF), Groningen: Groningen University, p. 40, ISBN 90-6781-014-2 . Looijenga cites Gerrets' The Anglo-Frisian Relationship Seen from an Archaeological Point of View (1995) for this contention. ↑ Bazelmans 2009 :321–337, The case of the Frisians. ↑ Halbertsma, Herrius (1982). "Summary". Frieslands Oudheid (PDF) (Thesis) (in Dutch and English). Groningen: Rijksuniversiteit Groningen. pp. 791–798. OCLC 746889526. 1 2 3 Homans, George C. (1957). "The Frisians in East Anglia". The Economic History Review. New series. Wiley. 10 (2): 189–206. doi:10.2307/2590857. ISSN 0013-0117. ↑ Blok, Dirk P. (1968). De Franken : hun optreden in het licht der historie. Fibulareeks (in Dutch). 22. Bussum: Fibula-Van Dishoeck. pp. 32–34. OCLC 622919217 . Retrieved 2014-09-17. ↑ "Geschiedenis van het volk der Friezen". boudicca.de (in Dutch). 2003. Archived from the original on 2009-06-08. Retrieved 2009-01-22. ↑ Who Killed New Orleans? : Mother Nature Vs. Human Nature. p. 29. ↑ Heinrich Schmidt: Politische Geschichte Ostfrieslands. 1975, p. 22 ff. ↑ Medieval Germany: An Encyclopedia, John M. Deep, Pub. 2001, Germany. ↑ Markus Meumann, Jörg Rogge (Hg.). Die besetzte "res publica". Zum Verhältnis von ziviler Obrigkeit und militärischer Herrschaft in besetzten Gebieten vom Spätmittelalter bis zum 18. Jahrhundert, Pg. 137. Papers from a conference held Sept. 20-21, 2001, at the Martin-Luther-Universität Halle-Wittenberg. By Markus Meumann, Jörg Rogge. Published 2006 LIT Verlag Berlin -Hamburg-Münster. ↑ The New Encyclopædia Britannica, Published by Encyclopædia Britannica Inc., 1993, p. 214. 1 2 "Greate Pier fan Wûnseradiel" (in Western Frisian). Gemeente Wûnseradiel. Archived from the original on 2012-09-14. Retrieved 2008-01-04. ↑ Fryslan.nl (1 December 2009), mun. and CBS. 1 2 "Kerncijfers wijken en buurten" [Key figures for neighbourhoods]. CBS Statline (in Dutch). CBS. 2 July 2013. Retrieved 12 March 2014. ↑ (in Dutch) Leeuwarden extremen tijdvak 1971 t/m 2000, Royal Netherlands Meteorological Institute. Retrieved on 26 April 2014. ↑ (in Dutch) Leeuwarden, langjarige gemiddelden, tijdvak 1981–2010, Royal Netherlands Meteorological Institute. Retrieved on 26 April 2014. ↑ (in Dutch) Emigration to the United States. ↑ (in Dutch) Overzicht aantal inwoners Provincie Friesland 1714–2000, Tresoar. ↑ (in Dutch) Bevolking; geslacht, leeftijd, burgerlijke staat en regio, 1 januari, Statistics Netherlands, 2014. ↑ "Rapportage quick scan Friese taal 2007 Provincie Fryslân - PDF". docplayer.nl. Retrieved 2018-06-10. ↑ Hammarström, Harald; Forkel, Robert; Haspelmath, Martin, eds. (2017). "Stellingwerfs". Glottolog 3.0 . Jena, Germany: Max Planck Institute for the Science of Human History. ↑ Hilton, N. H., & Gooskens, C. (2013). Language policies and attitudes towards Frisian in the Netherlands. Phonetics in Europe: Perceptions and production, 139-157. ↑ "De heer Arno Brok" (in Dutch), Province of Friesland. Retrieved 7 March 2017. ↑ (in Dutch) Verkiezingsuitslagen Provinciale Staten 1918 – heden, Electoral Council. Retrieved on 27 April 2014. ↑ (in Dutch) Station Leeuwarden in Leeuwarden, Rijksmonumenten.nl. Retrieved on 26 April 2014. ↑ (in Dutch) Wegenoverzicht, Rijkswaterstaat. Retrieved on 27 April 2014. ↑ (in Dutch) Algemene informatie, Ameland Airport. Retrieved on 27 April 2014. ↑ (in Dutch) Aanwijzingsbesluit Luchthaven Drachten Archived 2014-04-28 at the Wayback Machine , 2007. Retrieved on 27 April 2014. ↑ (in Dutch) Missie Friesch Dagblad, Friesch Dagblad . Retrieved on 27 April 2014. ↑ (in Dutch) Over de LC Archived 2013-09-17 at the Wayback Machine , Leeuwarder Courant . Retrieved on 27 April 2014. ↑ (in West Frisian) Oer de Omrop, Omrop Fryslân. Retrieved on 27 April 2014. Wikimedia Commons has media related to Friesland . Wikivoyage has a travel guide for Friesland . "Friesland" . Encyclopædia Britannica (11th ed.). 1911.